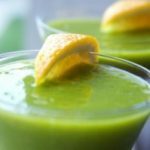 Date and Kale Smoothie for That Sweet Tooth Craving! 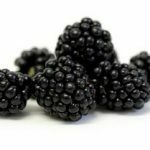 While there are the rare few that like to munch on raw kale and other leafy greens, getting in your daily veggies can be a challenge for many of us. 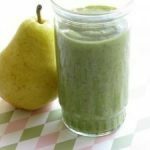 This green smoothie cleverly masks some of the most nutrient-packed veggies with the right amount of sweetness to trick even the pickiest of taste buds. 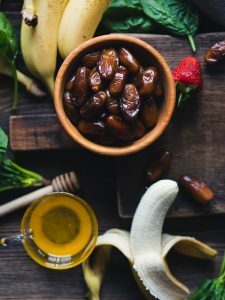 A hearty drink like this medjool date and kale smoothie not only provides you with vitamins and natural sugars, but also satisfies big breakfast aficionados with nut butter and chia seeds for a filling and fueling breakfast or snack. Dates, particularly of the medjool variety, can be thought of as nature’s candy. Date’s provide a sweet, almost caramel-esque richness to anything you blend them up with. Pairing dates with kale is the sneakiest trick in the book. 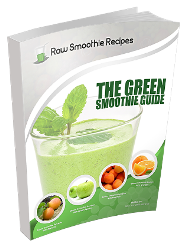 Aside from the green color of this smoothie, you wouldn’t know you are guzzling 2 cups of vitamin-packed greens. 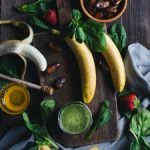 Between the sweetness of the dates, richness of the nut butter, and healthy goodness from the ripe banana, you won’t even taste the kale and spinach that make up a hefty proportion of this drink. 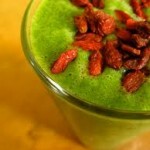 Kale, while trendy, has held recent spotlight in the health and nutrition world for good reason. Kale packs a punch as it is high in fiber, low in calorie, and stocked with vitamins that would make your head spin. Add to this leafy green team, spinach, an age-old favorite, and you’ll be nearing your fiber quota for the day. 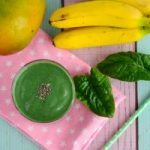 See who you can fool into eating 2 cups of green, leafy vegetables by blending up this smoothie for your next on-the-go, pre-school/work breakfast. 1 cup water or almond milk, you can substitute with soy or rice milk as well. 1. Combine water (or milk) with Spinach and Kale until smooth. 3. Add more Ice to taste.